Christina Carter and Connie Perdue took True, Axl (Belgian Tervurens) and Image (A Border Collie) out to the agility field for some training. True is an old pro at agility, but Image and Axl are both new to the idea. This video covers what Agility is and some of the basics of effective training such as the correct motivation and level of distraction. Agility courses consist of a set of standard obstacles laid out by a judge in a design of their own choosing in an area of a specified size. Agility surfaces may be grass, dirt, rubber, or special matting. Depending on the type of competition, the obstacles may be marked with numbers to signal the order they must be completed. The courses are designed to test the relationship bond between the dog and the handler. 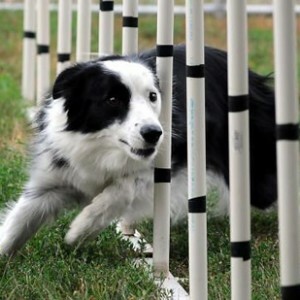 In agility competitions, handlers must assess the course and decide on a strategy that will best balance both speed and precision. Different direction strategies can be used to compensate for differences in the strengths and weaknesses of the various dogs and handlers.